I grew up fishing in New York State and have been “hooked” on the sport for over 50 years. I became a fly fishing guide in 2002 and am the owner and operator of Ms. Guided Fly Fishing Services. Ever since then I have been able to share my passion for this sport with my local community and beyond. I have been a volunteer for Casting for Recovery since 2001, a volunteer for Project Healing Waters visiting Walter Reed National Military Medical Center to work directly with our veterans on a weekly basis since 2007 also serving as a board member from 2012-2015. I have been a member of the Northern Virginia Chapter of Trout Unlimited since 1996 and have served as the Vice President since 2008. I am the past President of Chesapeake Women Anglers and a TFO ambassador. I look forward to being involved with the Mayfly Project! A native of central WV, Courtney grew up with a passion for the outdoors and the natural beauty of the Mountain State - - horseback riding, skiing, hiking... She just learned to fly fish in 2015 and fell in love with the peace she found on the river. As an attorney involved in child abuse and neglect cases, Courtney witnesses the pain of children who find themselves in foster care, and she's excited to share fly fishing with those children so that they can also experience the peace of the river and the thrill of a catch! The license plate on the back of Pamela Dunlap’s car says it all-TROUTCHIC! A lifelong resident of Wild, Wonderful West Virginia, she is the founder of Women Wine & Waders, a mountain state organization that promotes adventures, friendships, and accomplishments through fly fishing. Pam is the exclusive female Pro-Staff member of Lucky’s Outdoors in Summersville, WV and an Ambassador for 8 Rivers Fly Rod Company. She also designs handmade jewelry specific to fly fishing and enjoys teaching children fly casting at Beyond the Backyard. Additionally, Pam volunteers to help disabled veterans through Project Healing Waters and plans fly fishing events for women in a variety of venues. 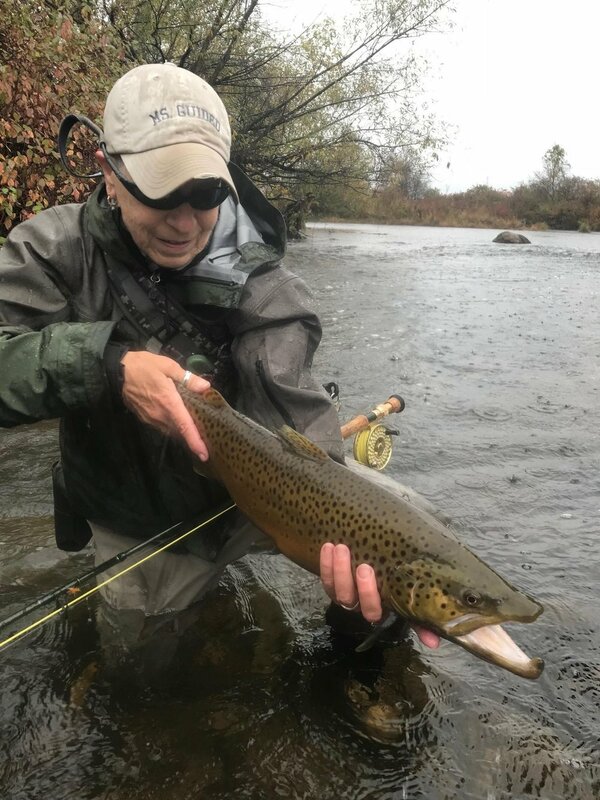 Guiding on the pristine waters of WV gives her the opportunity to share her passion for fly fishing and promoting state tourism while developing new and lasting relationships within the sport. Pam’s enthusiasm has reached beyond the borders of the mountain state as she continues to introduce women anglers to the sport she loves. Her excitement is growing as she embarks on the challenging position as the Lead Mentor of The Mayfly Project in her home waters of West Virginia.